First Line: Wales could be cold in February. Nine months after the death of his wife, antiquarian bookseller Peter Byerly relocates from North Carolina to the English countryside. He's trying to outrun his grief, but he's also trying to regain the pleasure he once found in collecting and restoring rare books. While browsing in a shop, Byerly opens a book on Shakespearean forgeries and finds a Victorian watercolor of a woman who bears a striking resemblance to his dead wife. He is now obsessed with learning the picture's origins, and little does he know but the trail of clues is going to lead him all the way back to Shakespeare's day and a priceless artifact that could change what we know about the Bard's identity. The Bookman's Tale is for book lovers, book collectors, book restorers, book historians, and Shakespeareans with all the knowledge it contains about these subjects as well as the almost fairy tale-like story of Peter Byerly. Peter has been burdened with crippling shyness his entire life. The only person who could make him forget that and start enjoying the world around him was his wife Amanda. His honesty and diffidence make him just the sort of main character for which a reader can grow to care. It wasn't long at all until I was cheering Peter on and wanting him to find joy in living again. As Peter's obsession with the watercolor and its artist grows, he finds himself becoming acquainted with two eccentric families, the Aldersons and the Gardners-- a British version of the Hatfields and McCoys. In America, the Hatfields and McCoys tended to shoot each other, but the Aldersons and Gardners are much more civilized. Instead of firearms, these two families seem to rely on deception and double-dealing over the centuries to get the upper hand. This puts Byerly at a distinct disadvantage, and he has to take special care as he does his research. This book was so enjoyable from first page to last that I almost didn't want to see it end. I do have a word of warning, however. The story has frequent changes in time period, setting, and point of view. I didn't find it at all confusing, but that was because I learned very early on to pay attention to the chapter headings that always told me when and where I was. 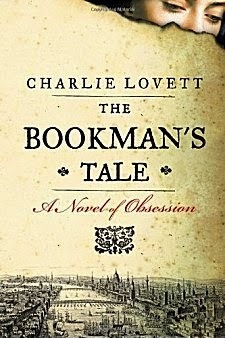 Charlie Lovett followed The Bookman's Tale with First Impressions which takes readers into the world of Jane Austen. He's shown that he has real talent for combining fascinating facts with spellbinding stories, and I eagerly await his third book. Oh, this does sound appealing, Cathy! There is just something about a physical book, especially one that's hard-bound, etc.. Those who really know how to make and restore books have my full respect. And the setting sounds wonderful, too. I think it would be wonderful to be able to create or restore a book! I liked The Bookman's Tale very much and have visited Hay on Wye where he lived. I didn't care as much for his follow up. The story was good, his heroine was awful. I spent an entire day wandering alone in Hay-on-Wye. I was in heaven! I have to agree with you about the heroine of First Impressions. She left a little something to be desired, but I still enjoyed the book. This book sounds engaging and unique. Thanks for the review, Cathy.